ANY SPECIES. ANY BODY OF WATER. 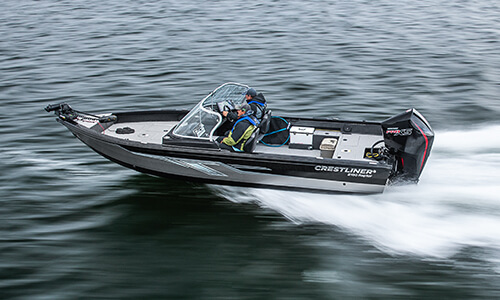 Crestliner’s multispecies boats are engineered to deliver unrivaled angling experiences throughout a variety of experiences and conditions. 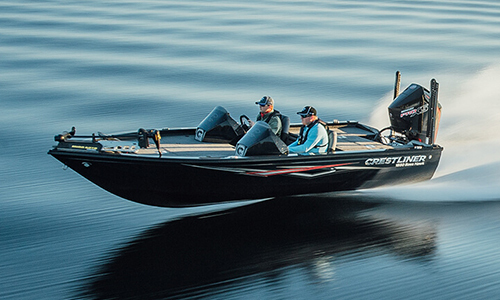 Whether you’re working a shelf for bass, running crankbaits for walleyes or maintaining a resort fleet—there’s a Crestliner for you. Featuring Deep-V construction, these boats sit deep in the water while maintaining a high sidewall for exceptional stability and protection. 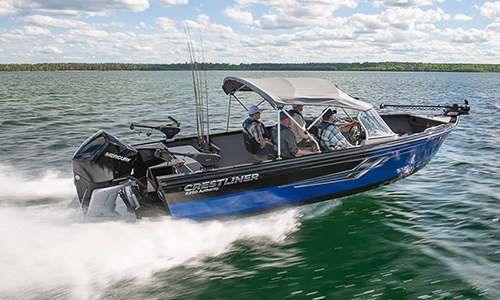 Every boat in the lineup is packed to the gills with fishing features like conveniently placed livewells, ample rod storage, and spacious casting platforms. The recharged Fish Hawk series can deliver everything you’d want from a fishing boat. The Discovery series is a no-nonsense option designed to quickly get you on the water. The Commander Series takes on big water with ease. 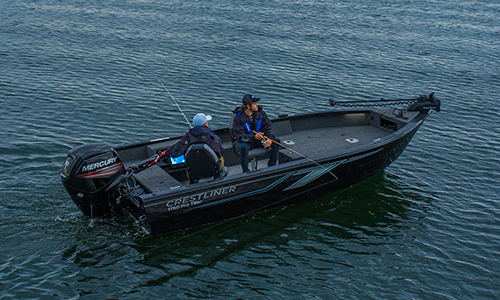 Whatever you fish, wherever your passion leads, there’s a Crestliner built to suit your style. No matter if the final weigh-in is your next goal, or if you live for the next angling adventure, look no further. The Raptor’s competition-ready features like insulated and aerated livewells and a large-capacity, illuminated rod locker make them serious contenders for your attention. The Fish Hawk is a proven winner for families and anglers looking to make the absolute most of their day on the water. Designed with direct input from anglers like you, the latest generation is another icon in a long line of legendary boats. When you’re taming big water chop and chasing for your next big catch, the Bass Hawk’s Deep-V hull adds confidence-inspiring stability, while raised bow and stern deck designs add vision and angling control. For the angler who prefers to fight for fish instead of space inside their boat, the Pro Tiller adds to the feeling with class-leading rod storage, ultimate access and command from the stern and tons of space. With tiller control, you’ll have enhanced maneuverability on the water, and in your boat. Weekend warriors: Meet your checks-every-box boat. The Vision is a multispecies boat that can fulfill any need. 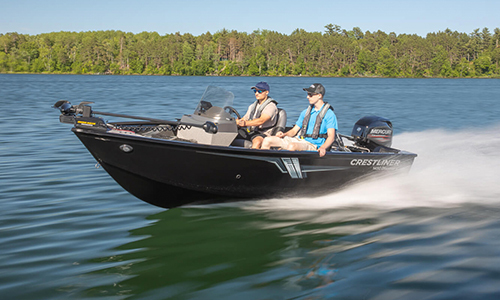 With multiple configurations that fulfill fish and sport demands, you’ll have the perfect, versatile boat that’s tailored to you. The Kodiak is a rugged multispecies boat with a heavy-duty aluminum hull that’s at-home in the far reaches of adventure. This boat is a dependable and fully-featured companion for all-season use. The Discovery emphasizes functionality that gives anglers quick access to rods, gear and the livewell so that success is always within reach. Featuring smaller lengths than most Deep-V models, this boat is perfect if you want a smaller fishing boat stacked with practical fishing features. Big waters, big stories and downrigging: just a few of the things the Authority was designed to master. Premium fishing features like lockable port rod storage and multiple aerated livewells are ready to help you land the season’s biggest catch. 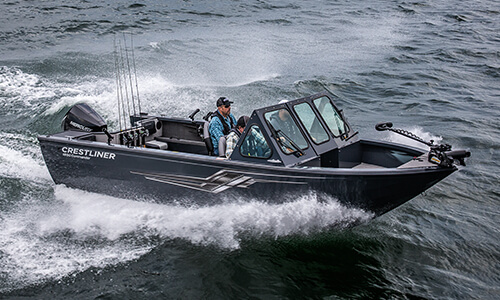 Tame relentless elements with Commander Elite’s battle-ready all-welded windshield, diamond plated bow and 30” forward cockpit designed to keep you tucked deep below the spray and chop of big-water fishing. The result is a smooth ride that’ll make you forget you’re on some serious water. 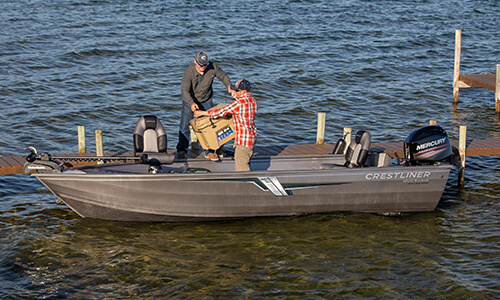 Designed to ride high and keep you dry for all-season conditions, the Commander is a rugged, open water fishing boat with features that suit: like a welded windshield and deep, open cockpit. When you go out on the water, you want to know that your boat will hold everything you need for the day ahead. Every Crestliner is meticulously designed to maximize storage so you have ample space for everything you need. From rod storage near the driver’s seat, to gear storage on the bow and stern, all of it is easily accessible for the moments you need it. 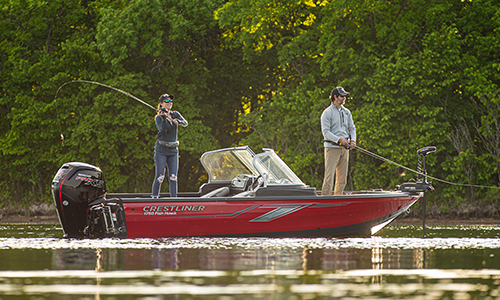 Each boat in the multispecies lineup is engineered to give anglers everything they need to own the day. Every boat is designed for the modern fisherman. The consoles include space for different sizes of electronics. Rod storage is maximized through in-floor lockers as well as other rod storage compartments found throughout each boat. With livewells placed right where you need them, you’ll have everything you need to take your angling to new heights. Crestliner’s are engineered to be strong and durable on the outside, and comfortable on the inside. That’s why we added jump seats to the new Fish Hawk. It’s why we use premium material on all of our seats. Fishing can be an exercise in patience, but your patience won’t run as thin if you’re relaxing in comfort. 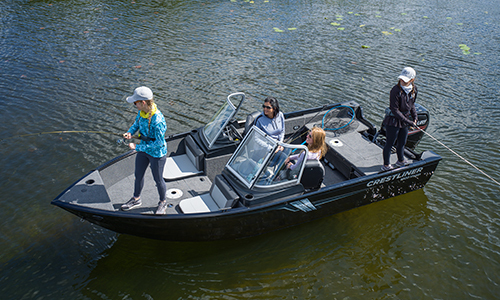 And every boat in the multispecies lineup is designed to maximize space, so whether you’re fishing solo or bringing friends and family, everyone will enjoy being on the water. Every Crestliner is constructed with a meticulous welding process and sheets of premium-grade aluminum. Each hull is all-welded to create a rock-solid, one-piece bonded hull that is unmatched when it comes to strength and durability on the water. In our Deep-V construction, a thick extruded full-length keel is integrated from bow to stern for added protection and control. So, every time you step into a Crestliner, you can feel the power and strength that will last for generations. 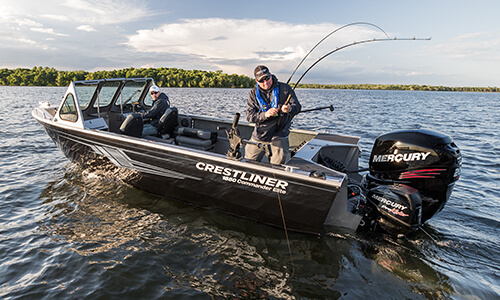 Crestliner and Mercury have formed a powerful partnership on the water. Mercury outboards come standard on many of our multispecies boats. When we match their industry-leading power with our unmatched durability, you get a boat that’s built to dominate the water. With high horsepower ratings on many of our models, and Mercury’s commitment to innovation on their engines, you’ll have a powerful combination that will be the envy of other anglers.